Because we are cyclists, we know the importance of being able to plan your training. We schedule our classes by training type, e.g. VO2 max, Sweet Spot Base etc. Unlike anywhere else, you know in advance what to expect from your workout. No surprises, just specific world class training. As part of joining us you get a personal consultation session with one of our staff. It’s our opportunity to get to know you and discuss your goals. During this session we take your FTP and Heart Rate information and create a personal profile within our training software. We then use this profile for when you ride with us to personalise the training session for you. No more guessing how many watts to push. Our cycling lab classes focus on all areas required for successful cycling performances and will work for you no matter your current experience or fitness. We cater for all riders - from Road to Groad, Triathlon to Mountain Bike, Cyclo-cross to Track. Classes are categorised by the type of fitness they help develop - for example endurance, strength, threshold, and VO2 max. No need to guess what type of workout you’ll be doing when you arrive. Our class schedule is also organised so that our classes reflect the requirements of the season. For example, a larger amount of base and endurance in the winter months, more strength and event specific training in spring, and then race preparation workouts in the summer. We offer care free perodisation of your training. You just need to ride! We also offer training programmes which are made up of 3-4 training sessions a week which will get you in perfect condition for your events. Our base endurance programme runs from November until April. We will offer additional training programmes from April which will help you prepare for events such as Vätternrunden. PRO LEVEL Training for EVeryone! Our schedule, training programmes, and classes are designed by, or with the advice from, Mattias Reck who is the coach for the Trek Segafredo World Tour Team and Founder of Guided Heroes. We’ve brought Pro Level Coaching to everyone! All our classes include workout information which is displayed in front of the bikes on huge projector screens. From this information you can easily see a summary of the workout and also what you are expected to be doing in the current interval. Your personalised rider box. The LOAD is your goal wattage and the WATTS is your current output. The main display shows the full profile of the workout session. Our instructors guide you through and motivate you to deliver your best performances. We know that sometimes life can be unpredictable and you need the flexibility to train whenever you can. Accordingly, we offer training sessions in our cycling lab from open till close. During prime times we have coached classes where one of our amazing team of instructors (who are all riders themselves) present and guide you through your workout. Our coaches don’t sit in front of you on a bike, they instead use all their energy making sure you get the best workout possible. Our coaches will give you personal attention and take the time to explain why the workout is important and how it is going to make you a better rider. In between the prime time sessions we use our software to run uncoached classes. These sessions will often be longer base training sessions or be ‘own ride’ sessions where you can come in and do your own training on our bikes. We will also offer Sufferfest and Zwift rides. We have made sure that everything in the Studio is the best we can find. The bikes in the cycling lab are no exception. We have chosen to use WattBikes in the Studio. The WattBikes will collect all your power and cadence data which is then collected and displayed in front of you via our training software. The WattBikes also provide you with real time pedaling analysis information on the screen of every bike. Each bike has a Wahoo heart rate monitor allocated to it. This heart rate monitor is connected to our software so all you need to do is use the clean strap we give you and your heart rate data will be collected and displayed. So really all you need to do is bring your shoes. If you don’t ride Shimano pedals we can provide most other brands for you to use for your session. Just let us know in advance and we’ll get your bike ready for you. instant data. delivered how you want it. Data is no good unless you can capture it and then analyse. We make it easy. No need to try to pair your phone with the bikes. By the time you are out of the shower or sauna you will receive an email with a summary of your performance and a workout file attached. 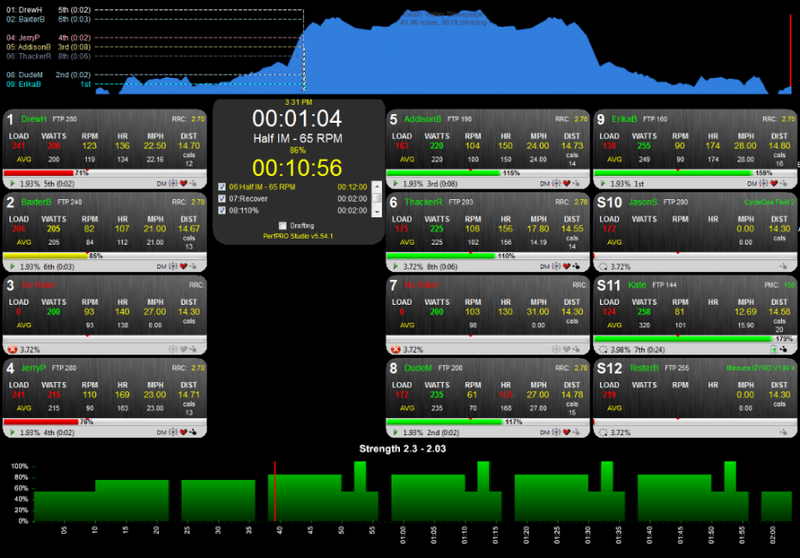 We also push your workout data to your analysis software of choice e.g. Training Peaks, Strava, and Today’s Plan. You’ll find the details of the Mattias Reck training programme which runs until the end of April by clicking on the link below. It will bring you into the Spring with great base and endurance fitness. After the completion of the winter programme we will start our other event and discipline specific programmes.